Symphony by the Sea, the North Shore’s premier professional orchestra, will celebrate the 100th anniversary of Leonard Bernstein’s birth with “Bernstein & Beethoven,” a concert featuring excerpts from his most popular and enduring achievement, “West Side Story,” and Beethoven’s Symphony No. 3 (“Eroica”). The historic Cabot Theater in Beverly will host the concert on Sunday, March 4 at 3 p.m.
Bernstein, whose given name was Louis, was born in Lawrence to Russian immigrant parents, and attended Boston Latin School and Harvard University. He burst onto the American music scene in 1943 when he substituted for the ailing Bruno Walter as an 26-year-old unknown assistant conductor, leading the New York Philharmonic in a critically acclaimed concert. Maestro Donald Palma, music director of Symphony by the Sea, has a special and personal connection to Bernstein (1918-1990), who was the grandson of a Ukrainian Hassidic Rav (Rabbi) and the first American to become musical director and conductor of the New York Philharmonic. Palma grew up in New York, where he attended the Juilliard School and joined Leopold Stowkowski’s American Symphony at age 19. He worked with Bernstein on several other “awe-inspiring concerts” and attended many of his performances at the New York Philharmonic. “I even sent him a piece I wrote when I was 12-years-old!” Palma said by email. 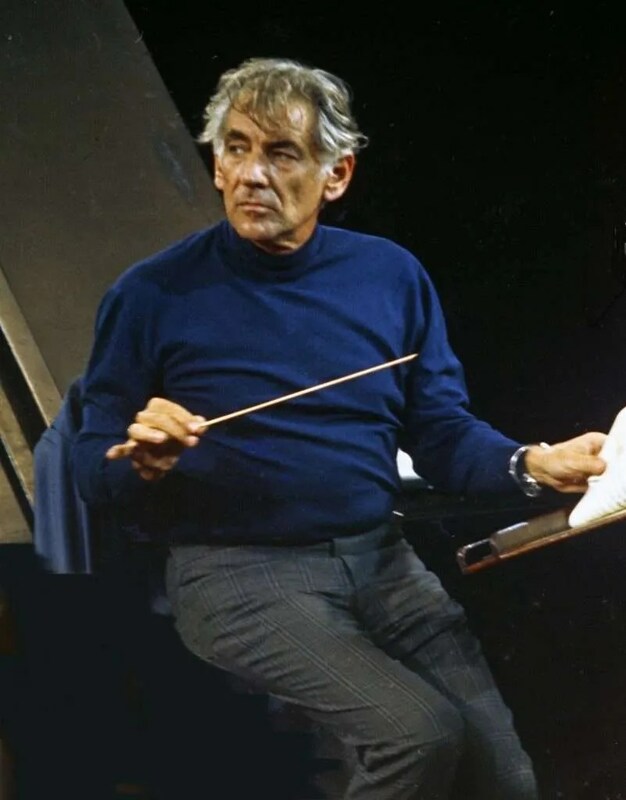 In 1984, when the German classical music record label, Deutsche Grammophon wanted Bernstein to record “West Side Story” in Germany, he insisted the recording be made on the West Side of New York with New York musicians. Bernstein invited Palma, a prominent classical double bassist, to play principal bass on the record. “One of the high points in my career was recording ‘West Side Story’ with its composer. We recorded not far from where the action of the play takes place,” Palma said. Bernstein’s children provided the spoken dialogue and the BBC documented the week’s proceedings. A year after his conducting debut, Bernstein established his composing prowess when New York critics awarded his Symphony No. 1 (subtitled “Jeremiah,” in reference to the story of the sixth century B.C.E. Jewish prophet) their highest accolade, pronouncing it the most impressive new work of the year. Although Bernstein was not traditionally observant, his life and music were steeped in Judaism. He accepted a commission from the Park Avenue Synagogue in New York City in 1945 to compose liturgical music for Shabbat services. “Hashkivenu” for cantor mixed chorus and organ is Bernstein’s one work specifically for the synagogue. He first visited Israel in 1946, when he conducted the Palestine Symphony Orchestra, and he was later appointed the first conductor of the Israel Philharmonic. To create “West Side Story,” choreographer Jerome Robbins convened a quartet of Jewish artists – the composer, Bernstein; the lyricist, Stephen Sondheim; the librettist, Arthur Laurents; and Robbins, the director and choreographer. The show transfers Shakespeare’s “Romeo and Juliet” to the tempestuous streets of 1950s New York City’s Upper West Side, where two star-crossed lovers find themselves caught between two rival gangs of different ethnic backgrounds: the white Jets and the first-generation immigrants from Puerto Rico, the Sharks. The centennial concert adds an exciting twist to nine musical selections from “West Side Story” by combining them with stage direction by Penny Singh, narration by playwright, actress and Salem State University professor of theater, Anne Marilyn Lucas, and vocals by the Endicott Singers, directed by Rebecca Kenneally. Although written over 50 years ago, Kenneally’s students uncovered contemporary messages. “The themes of gang violence, prejudice against immigrants, police brutality and troubled youth seem especially relevant today. The subject matter is as deep as the musical language Bernstein uses to discuss it, and the students are hungry to explore these depths fully,” she said. Palma deliberately paired Bernstein’s “West Side Story” music with Beethoven’s Symphony No. 3. “Lenny was a larger than life figure and as great if not greater than his reputation. He taught so many of us, through his Young Person’s Concerts and Harvard Lectures, how to think about Beethoven’s music,” he said. On March 4, the great Maestro’s legacy will live on under the baton of one who still feels the thrill of having been touched by his greatness. For more information, visit symphonybythesea.org or call 978-922-1248.